Tuesday’s election results–why the surprise? 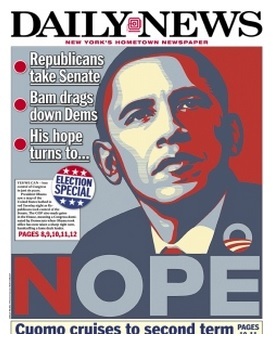 Daily News cover from the day after the elections. On Election Day, I got a job as a Brooklyn, NY poll worker, which was fortuitous. I was far too busy telling voters how to insert their ballots into the scanner to keep up with developments in the electoral auto da fe that hit most of the US. Some of the news was really shocking–I found it very hard to believe that Staten Island’s own Michael Grimm was returned to Congress, even with federal indictments already having been served and a video of him threatening to throw a reporter off a Capitol balcony having gone viral. Rick Scott returned for another term in Florida? Joni ‘I like to butcher hogs’ Ernst sent to the Senate to represent Iowa as a state of mouth-breathers? A state that puts an unqualified or radical individual into the biggest federal job short of the POTUS is sometimes relegated to being a national joke. Remember Nebraska’s own Roman Hruska? Google him. And yet, the overall result should not be surprising to anyone. The idea of change is always more motivating than preservation of a lousy status quo. Democratic apologists have spent the past few weeks talking up Obama’s great record and all the great news (Dow is up 7,000 points! Deficit is lower than when O took office! Unemployment is under 6%!). Two of those things are true, but probably don’t matter to the 99%. The third, the unemployment rate, is heavily gamed by both parties and has been since Inauguration Day 1981. True, we’re better than we were in January of 2009. But if high (undercounted) unemployment and permanently stagnant wages are the new normal, who wants to go defend that at the polls? Voting for the Dems this year was (mostly) about voting for the status quo. The whole ‘vision thing’ escaped them. But it didn’t escape the Republicans and it didn’t escape third party candidates like NY Green Party regular Howie Hawkins, who ran against Cuomo and Astorino for the job of being the Empire State’s governor. Well, here’s my little microcosm of Local Election Day Hell in terms of casting a ballot in my part of Brooklyn. My serving congresscreature (and Comedy Central embarrassment) is a nepotism appointment by the Dems, so it’s nearly impossible for someone else in the party to challenge her in the Democratic primary. Her Republican opponent didn’t even bother to post a bio or respond to press inquiries, and Republicans are a rounding error in my district. You can gerrymander this district all you want and the results stay the same as long as there are only two parties. My state assemblycreature race was between a Repub challenger who wants to raid state monies to help pay for private religious schools and a Dem incumbent who is on record trying to raid state monies for same. I wrote myself in on that ballot line. Then we come to the Gubernatorial race, and rarely has the phrase ‘Goober‘ been more appropriate. The race was between a bullying and corrupt governor who wants to give the heave-ho to teachers’ unions, and a corrupt challenger who is pushing for fracking and getting rid of teachers’ unions. I pulled the lever for Howie Hawkins. And voting for a third party had a positive effect in this election. First, Hawkins got enough votes to secure the fourth line of the next ballot, kicking out Working Families Party from that slot. The WFP lost respect from the progressive community by giving their ballot line to Cuomo, and it cost them. Cuomo also sabotaged the WFP by creating a new Women’s Equality Party, which siphoned off votes from WFP. Does that mean in the future the Working Families Party will not rubber-stamp powerful Democrats? One would hope so. By the way, Cuomo exerted almost no effort to help down-ticket Dems running for state legislature. So more gridlock is on the way in Albany. Back to the national level: In the post Citizens United era, politicians of either party can’t promise to go after the corporate interests that are the great Vampire Squid of American capitalism. The anger and disgust welling up in the population at large is being harnessed by the GOP to use against the vulnerable of society–Willard Romney’s forty seven percent . Democrats cannot channel that anger against the plutocrat donor class–President Obama himself refused to allow the People with Pitchforks to have at the bankers and speculators who crashed the economy, and it’s too late in the game to go back. And most Democrats see no advantage to calling out the ‘Tom Bradley Effect‘–white voters who won’t admit that they will not support candidates of different races. Even though he wasn’t running, Obama is at the top of the Democrats’ ticket and defines the Democrats for better or worse. And anybody who thinks Obama’s race isn’t part of the toxic sludge of American politics is in denial. Incumbent Senator Mary Landrieu of Louisiana did address this very issue in this campaign. It’s probably why she’s facing a runoff election with a dismal chance of victory. And it’s probably the (unspoken) reason why most Democrats didn’t try to run on Obama’s record, which has accomplishments but which reminds white constituencies of that foreign-named probably Kenyan Muslim guy who lives at 1600 Pennsylvania Avenue. Probably the only good news is that (thanks to the Senate GOP discovery of the tactic of cloture), it’s probably impossible to move Republican agendas forward in the next 24 months. Harry Reid can now apply the anti-democratic tactic that the GOP has used since 2010 to stymie forward movement on any progress on issues like the environment or employment. Then again, the world doesn’t stop for the next 24 months simply because the Americans can’t elect a government that works.